I was listening to NPR the other day, and they mentioned it was the third anniversary of the disastrous Missouri River flood of 2011. I remember that event well, because not only was I there…but it changed my life. I was tooling along Interstate 29 on a sunny and hot morning in July, en route from Cameron, Missouri to what was supposed to be Cheyenne, Wyoming. This was during my solo road trip a few years ago (and can I just state, for the record, I cannot believe it has been nearly three years since I embarked upon that adventure?! It remains to this day one of the highlights of my adult life). A few minutes after I snapped the above photo, I was forced into a detour because the whole freakin’ interstate highway was underwater. That detour took me deep into the Missouri countryside and eventually into Iowa. That was an extremely frustrating morning because I was shunted NORTH when I needed to go WEST. I had plans, you see. In my original blog post, I wrote about how I’d planned to stop for lunch at Raising Cane’s. While that was true, the possibility of missing out on chicken fingers wasn’t my biggest concern. I was supposed to meet up with a girl two days later, you see. Not just any girl. My wife, Tara. Of course, she wasn’t my wife back then. Or even my girlfriend. I’d only met her in person once, a few months earlier, but we had a friendship that had deepened over the years, and enjoyed each other’s company. Early on during my journey, she messaged me and said if I happened to pass through Ely on my way home, I was welcome to stop by her place for a home cooked meal and a free place to crash. This was a tempting offer, because by then I was already tired of meals served in paper bags (but again, food was not the primary motivation here). Unfortunately, Ely was nowhere near my travel route. Tara was willing to drive the four hours to Twin (as the locals call it), so we made tentative plans to meet up there. It would have been my last night on the road, and it worked out great for my schedule. Cameron, MO to Cheyenne, WY: 616 miles, about 9 hours. Cheyenne to Twin Falls: 614 miles, about 9 hours. Twin Falls to home: 559 miles, 8.5 hours. The math was in my favor. That damn river, however, was not. It cost me an extra 2.5 hours on the road, and prevented me from reaching Cheyenne. I ended up instead in Sidney, Nebraska – a place I had never even heard of before, and over 100 miles farther east than I’d planned on being that night. Which meant the next day I only made it as far as Ogden, Utah – 183 disheartening miles from Twin Falls. I called Tara from my motel room to let her know our planned rendezvous wasn’t going to happen. When I hung up, I poured myself a rum and Coke, determined to drown my sorrows in the heart of Mormon country. What if Tara and I had met up seven weeks earlier and a state away from where we actually did? Would the life we’re living now even remotely resemble that alternate reality? It would have been a memorable final night on the road, I know that much. But is that all we would have today, a fond memory of Twin Falls, Idaho? It’s possible that we would have started dating sooner, and everything else would have fallen into place as nicely as it has. Or maybe not. I might still be living in my townhouse, single, miserable, and broke. She could be in Ely. We could be married to other people. Divorced from other people. Dead. Though we can contemplate possibilities until the cows come home, there is no way of reading Fate’s hidden hand. The “what if”s are forever hidden behind a veil, an eternal and unknowable mystery. The only thing I can say with any degree of certainty is, we’re both thankful that things happened exactly as they did. All the what if’s lead to the now. I believe in fate. Absolutely. I could not agree more! You know its funny because we never really think of the negative things as a positive impact on our lives. I love this post because it shows that although your plans got derailed and you were super bummer out you acknowledge that things had to happen the way they did for you to have the life you do now. Definitely a reminder we all need! That’s true. When something doesn’t turn out the way you want it to, it’s very hard in that moment to think in the long run it might be for the best. But that’s why they say hindsight is 20/20. AMEN, Mark!! This post is awesome because it’s a clear reminder that everything happens as it should and at the EXACT time. And we may not realize that at first, but it’s an experience like this that reminds us. There is something to fate and destiny. I’ve written about fate and destiny before, and couldn’t agree with you more. Everything really DOES happen for a reason. I’ll always believe that. Have a great weekend, Ron! We’ve had some trip detours and it’s hard to not get stressed out about events beyond your control. Sounds like it was still a happy trails ending for you two! Earlier in the trip, I made a couple of unplanned detours (Spam Museum, Buddy Holly’s crash site) and they both turned out to be highlights. There’s a lot to be said for going with the flow. Pun intended. I too have also wondered how things would have turned out if I had not made it to Noah’s boat in that other flood some years back. Does this mean somewhere else there’s a Carl doppelganger walking around? So glad it turned out the way it has for you two! Great shot of the river. You’re telling me there’s a road under that water? 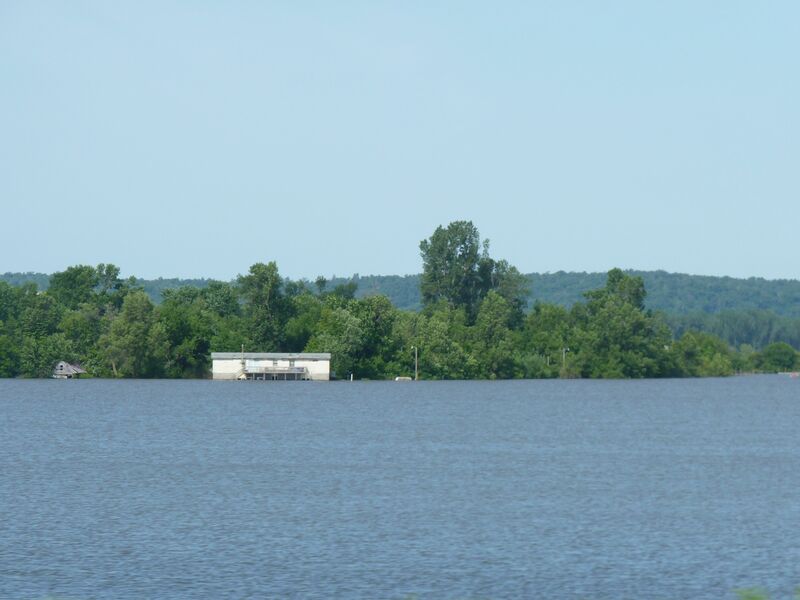 I think that area was mostly farmland, but a little farther north the water covered the interstate. Unreal, huh? What an amazing story–and an even better retelling of it! Our home was flooded in 2010 in the Nashville flood. We had to rebuild and now we’re waiting for the property values to come up a little so we can sell it and move. I don’t want to go through that again! I feel for people whose homes flood. That’s got to be terribly frustrating (and expensive to recover from). I hope you find yourself on higher ground soon! It’s fascinating how life works out sometimes. It’s about another month away, but close enough! Thanks. I’ll assume your gift is in the mail. It must have been fated to happen the way it did since you’re both so happy today! I second that emotion, and have mentioned Fate on this blog often!